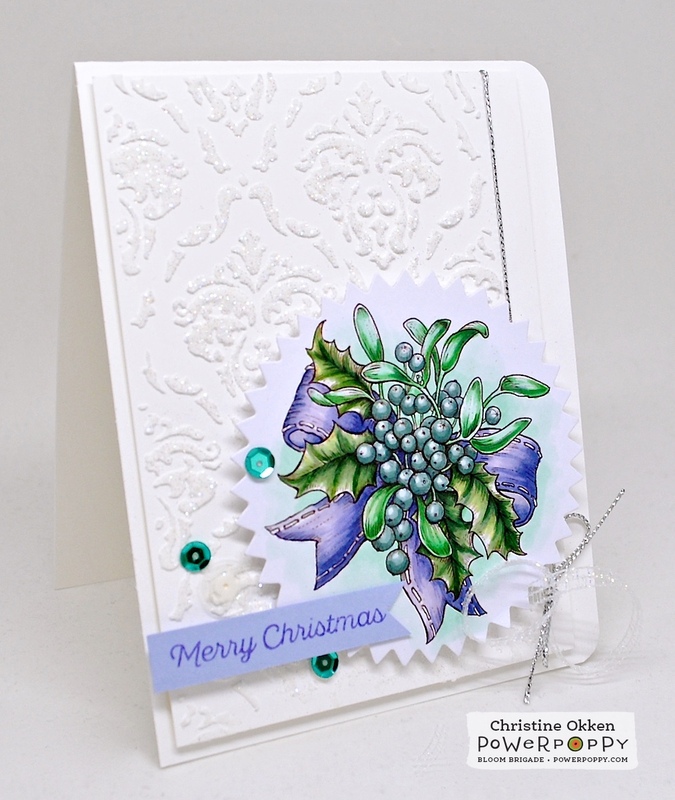 I thought I’d pull out a card I made a few weeks ago that celebrates some frosty shimmer in a very clean and simple way. 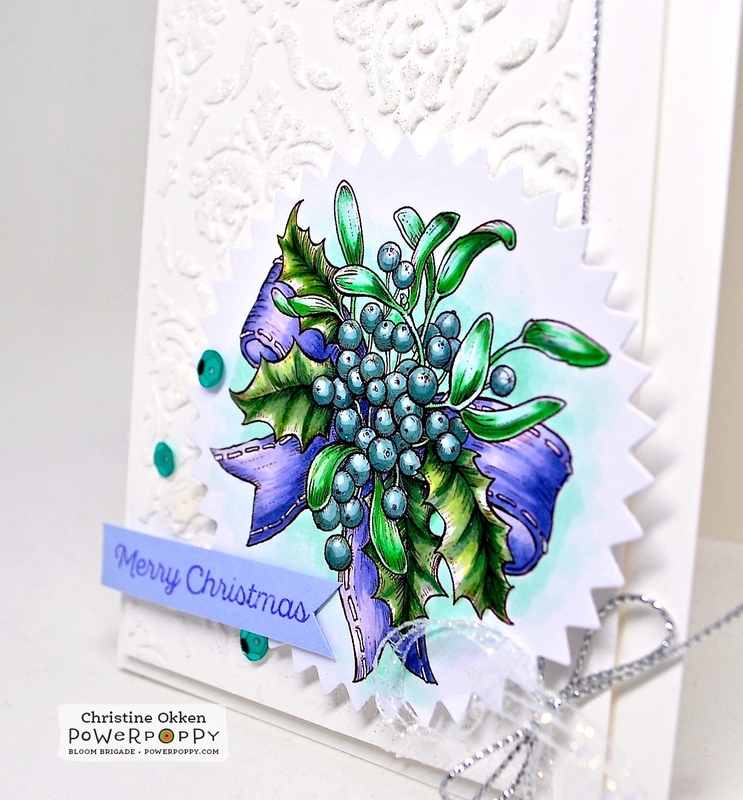 I began with Power Poppy's Digital Stamp - Merriest Berries, on Copic XPress it Blending cardstock. What’s awesome about this set is that it comes with three different variations of a bubbling cluster of Holly and Mistletoe overflowing with berries. One version just has the bow, one, has dovetail ribbon ends and one has a candy cane in it. I added some colour with Copics in a cool palette with a little bit of sparkle on the thread of the bow. I placed it all on a layer of white where I had added embossing paste through a Tim Holtz stencil (Gothic), while the embossing paste was still wet, I sprinkled it all with giltter so that it would dry in the paste and it gives it a beautiful shimmer. Just a wee bit of curly sparkly ribbon, some silver twine, and a bit of sequins for accent. 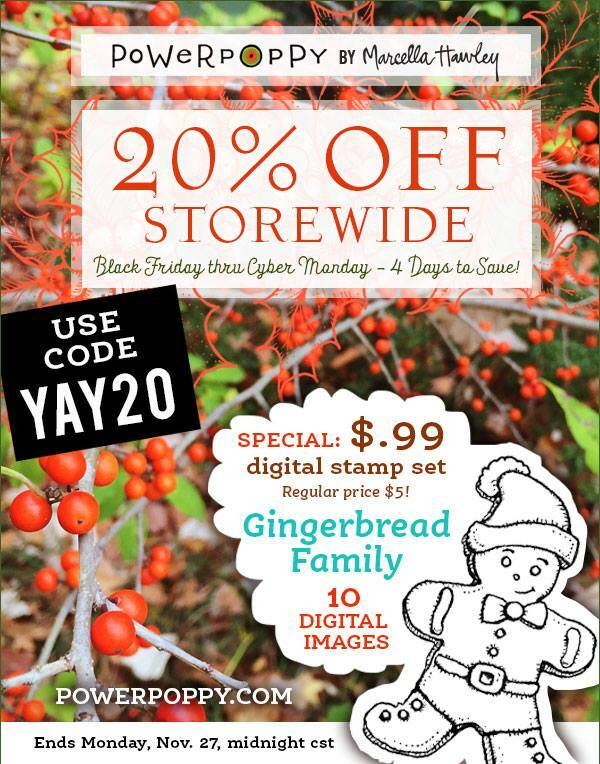 Did you see Power Poppy’s wonderful Black Friday (and Weekend) Sales??? Be sure to check them out on the Power Poppy Blog! And here’s the Bloom Brigade playing along today. A month! Eeek! I've got a lot of coloring to do! Every time I see this digi colored up I wish I'd gotten it, but glad I've got the similar new clear set now. This is so beautiful with your cool blues and glittery background! Oh, Christine, each time I visit your blog, I LOVE the new look! Beautiful! And what an amazing card with your fabulous coloring! This is such a stunning image, and you've made it "shine" so beautifully! I love the texture, and I cannot (truly) believe Christmas is less than a month away! Eek is right! I'm with Leslie...I have a lot of coloring to do! Thank you for sharing your gifts and inspiring me...and I'm with you about the crowds. I stay home! Warm hugs and love, sweet friend! This is one gorgeous card. I love the design and image is just pretty awesome with the blues and greens. Love it!